Starting April 11th, the Indian population will begin voting in the general election. This year there are an estimated 900 million eligible voters in India, the largest democracy in the world. Elections will be held across the country in seven waves that span almost six weeks. 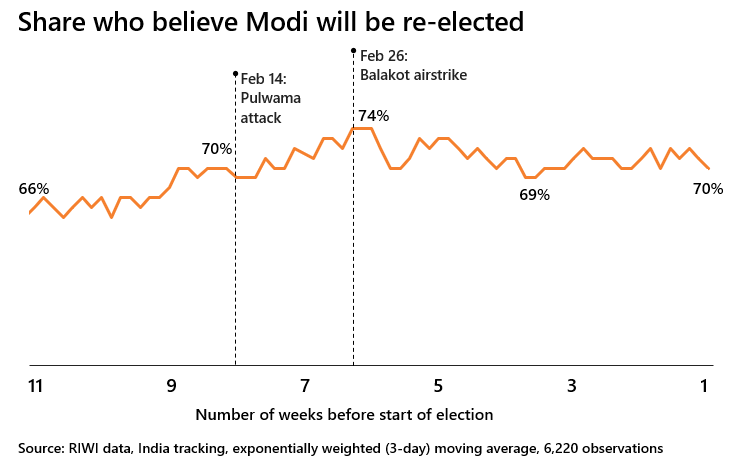 RIWI’s continuous tracking in India in the 11 weeks before the election shows that people are generally confident that Modi will be re-elected. Modi will be re-elected if his individual or coalition party wins the majority of seats in the Lok Sabha (the lower house of Parliament). The belief in Modi’s win is broad-based across the country and consistently strong over time, growing since the beginning of the campaign period. The signal is based on RIWI technology that includes a diverse range of voices, including those of young people not typically included in traditional surveys, and also of both rural and urban respondents. Almost two-fifths of respondents are rural. To continue reading RIWI’s work on India election sentiment tracking, click here.